Here you can find answers on the most frequent questions asked. 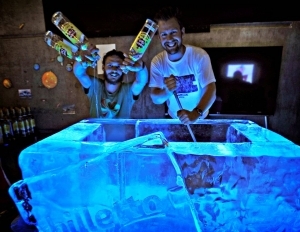 How long time does an ice sculpture last? The ice sculpture will last approximate 6 -10 hours, depending on the design. The first thing that will melt away,is eyes, feathers ectopic. A sculpture melts 1 cm per hour in room tempature. 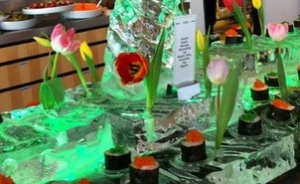 What is the weight of an ice sculpture? From few kilos to tons, but average for a single block is 80 kg. Can we freeze in items in the ice? Do you color ice too? We also color ice, BUT we recommend to set up the ice out of reach. We use fruit color you will have your fingers colored if you touch the ice. We don’t add anything to the water, but take the calk out. 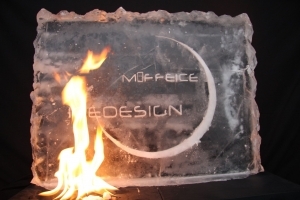 The freezing method is what make the ice clear an strong. Which sculpture can be ordered? All sculptures are handcarved with chainsaw and high speed tools, so anything is possible after your wish. How long time in advance should I order? A week’s not is and preferably before. In some cases we would be able to help you within 24 hours.